When parents begin to think about what learning environments best suit the needs of children moving into adolescence, they are often met with many different educational concepts and ideas. But it’s not always easy to see how various approaches to learning and teaching translate into the classroom experience. It’s fair to ask: What can students expect when they join a Middle Years Programme (MYP) learning community? We spoke with experienced IB educators to find out what it’s like inside an MYP school. The first thing students often notice in Year 1 of the MYP is that there are many more teachers than in most primary or lower schools. This is often a big change for students and parents. Each teacher is likely to apply a wide range of teaching strategies and learning engagements. Behind the scenes, lots of teachers also means the need for collaboration among educators themselves. This is built into the MYP framework. 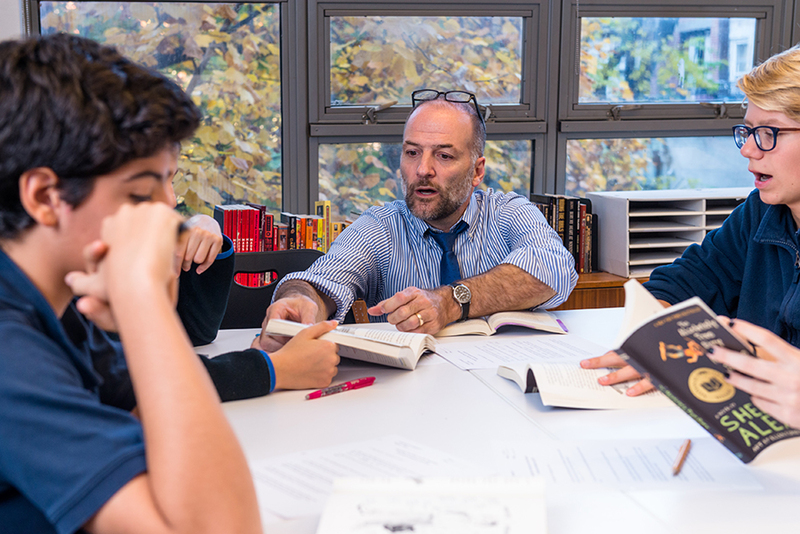 Teachers in the MYP work together to help students make connections across subject groups, placing an equal emphasis on eight equally important areas of knowledge. Almost every MYP student will have homework, projects, papers, and (usually) extra-curricular activities. Learning how to manage a more complex academic landscape is a big responsibility. The MYP encourages students to learn about themselves and make important decisions as reflective, independent, self-aware, internally-motivated learners. Your student will have more choice in how to complete their work (for example, making a personal reading schedule, choosing among assignments or topics for research, selecting activities, and collaborating with others). MYP students build personalized tool-kits of learning skills that they can use in school and in life beyond the classroom. Visiting a middle years programme near you? The IB has worked with the Association for Middle Level Education (AMLE) to create a guide for parents exploring a middle years education. It offers examples of what to ask and who to meet to help families better understand what learning looks, sounds, and feels like in the school community. In MYP schools, students are likely experience a mix of lecture (direct instruction), individual and group learning activities, class discussions, hands-on investigations, individual practice, and highly-participatory learning environments in which they interact with other students extensively. The MYP includes purposeful student collaboration in all subjects. Parents who visit an MYP classroom at any given moment may wonder, Why isn’t the teacher talking? In the MYP, students are often learning with and from each other, working in pairs or small groups. Many MYP classrooms are arranged to help facilitate this interaction throughout the day. Students learn to share their ideas, provide each other with feedback, and work together. All IB programmes are inquiry-based. MYP students will be encouraged to ask many questions, and to ask how they can connect their learning to their personal experience and the wider world they are discovering in the middle years. For example, while exploring acidity in science class, students may examine local streams and investigate human impact on water quality—or even organize a campaign to challenge the community’s ideas about environmental justice. It’s all a part of learning in the MYP! A simple question like, “Who decides where crosswalks are installed in our town?” opens the door to broader discussions about human behaviour, civic engagement and local government. Through the MYP students are asked to begin reimagining themselves – as curious, engaged and responsible young adults who play an important roles in both local and global communities. As students progress through the MYP, they develop the knowledge, skills and attitudes necessary for success in the IB Diploma Programme (DP) and Career-related Programme (CP), or other challenging qualifications. Sky Brandt manages communications projects for alumni and parents at the IB and is based out of Washington, DC. Ocie Grimsley is a student at George Mason University and is completing an internship at the IB.